I recently had to program an ATtiny85. As I was developing, I got tired of repeatedly wiring the connections between a 6-pin ISP socket and the ATtiny, and wanted something more permanent. I found myself sucked into Eagle CAD and this is the result. 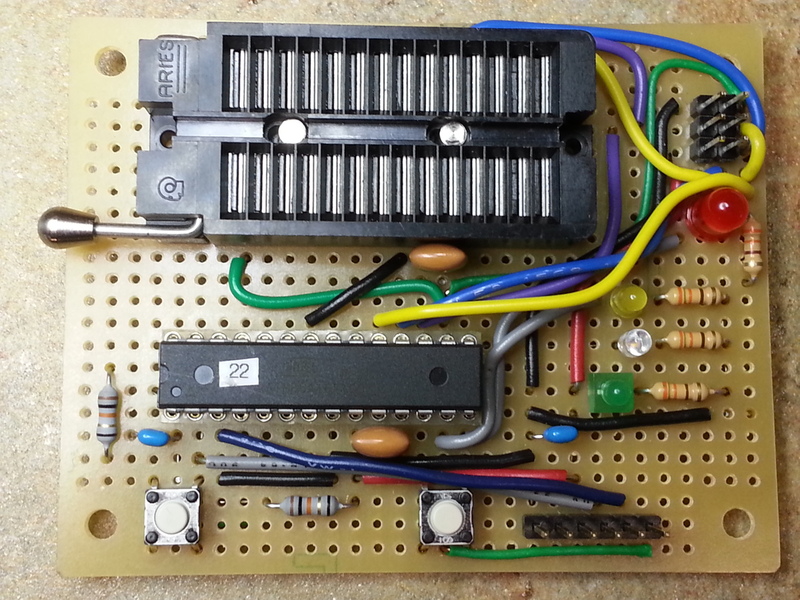 It has everything necessary to program 8-pin and 14-pin Atmel microcontrollers ATtiny25, ATtiny45, and ATtiny85. The gerber files are available at my Github repository. The circuit is quite simple – it connects the ISP pins 5V, GND, ~RST, MISO, MOSI, and CLK to the corresponding pins on the ATtiny, allowing for easy programming with any ISP programmer. It breaks out the power pins of either board to a pair of pins next to the ISP socket, and it breaks out and labels all the other pins of the ATtiny along the side of the board. For use in development, the programmed chip can be powered through the power-input pins near the 7805 voltage regulator (give it 7-15V); in this configuration the 10K resistor pulls up the ~RST pins to enable the ATtiny chips to operate. Lightning strikes. It struck near me, and fried a component of my old X10 home-control system. X10 is a power-line-based communications network. Data is sent (slowly) over the house power lines by injecting a 120 kHz signal into the 60 Hz AC signal just after the zero-crossing of that signal. One bit per cycle is sent by either adding or withholding a short pulse of the 120 kHz. X10 devices are either plugged or wired into the house power lines. Each device has an address, not necessarily unique, which consists of a house code A-P and a unit code 1-16. The original design intent was to have each house in a neighborhood choose a unique house code, to prevent signals from the neighbors from controlling one’s own devices. The data sent over the power lines corresponds to commands like “A03 AON”, which says to turn on any device with house code A and unit code 3.
a logic-level input which causes the generation of the 120 kHz carrier. It was controlled by an old Arduino which passed commands between the TW523 and a UDP socket using an Ethernet shield. A Perl script on another computer provided the intelligence – receiving messages from the X10 system and an auxiliary RF control box, from my MQTT message broker, and from a Perl scheduler. I subsequently found that the devices aren’t manufactured anymore. Fortunately, Jeff Volp produces a plug-compatible replacement, the XTB-523. I’m not yet using its extended capabilities, but am enjoying the higher reliability produced by its higher-power signals. However, being a geek, I had to make other improvements to my system. I didn’t like the power consumption of the old Arduino and its Ethernet shield – the Arduino’s voltage regulator was always quite hot, and I was afraid it would cook itself. I also didn’t like the solderless breadboard I had cobbled together 20 years ago as an electronics newbie – it was a mess. I also needed to create a better hardware setup – I wanted to plug the Huzzah into a board with its own voltage regulation, level shifting, and an RJ11 jack for the phone wire to connect it to the XTB-523. I entered the schematic into Eagle and laid out the components as if I were going to produce a PCB. I do this even when I’m going to hand-wire a circuit board, just to the point of laying out the components but not laying out the traces. I generally also create and record a color code for the wires, which will help me in future debugging. This time around I also remembered to add some test points onto the board. I have a 4-pin header for the power (Vcc, 5V, 3.3V, and GND) and one for the 4 connections to the XTB-523. After some major troubles with the software, I got it all to work. The main software trouble was a bug in the X10 library. I was getting an ESP8266 fatal exception when I enabled receiving. As I tried to create bread crumbs ( Serial.print statements ) and follow them back, I found that the problem arose in an object method that was called from an interrupt service routine (ISR). Now, it’s a really bad idea to do anything in an ISR that takes any significant time at all, because other interrupts want to be serviced, too, and they can’t while one ISR is in control. Print statements take a really long time ( from the perspective of a computer ), so trying to put them in confounded my search for enlightenment. Eventually I got frustrated enough to put some print statements outside the ISR and learned that the object’s .cpp file had to define an object pointer ( so the ISR could call an object method ), but that it wasn’t initialized to point to anything. When you try to dereference a null pointer, bad things happen. Once I found that, I was past the hump. I almost said, “Once I found that, I was home free.” But I wasn’t. I still had (gasp!) bugs in my own code. They were, however, readily found and fixed. I’m trying to embed a Jupyter notebook page as a blog post. I saved it as html, and copied an pasted that html below. I don’t think that’s the best way to do it. And now we want to see how many updates we get in one second. We don’t expect to get a very consistent number, because we’re not being really accurate with our timing. It looks like time.monotonic() is a count in seconds, but with high precision. The number we get, 8.8 or so, from the above routine is consistent with about 1ms updates which were the rough guesses of the previous program. But based on the variation across runs in the result – from 7.8 to 8.9 or so – coupled with the visual impression of there being unexpected pauses in the flashing of the NeoPixel, indicates to me that there’s some overhead in CircuitPython that makes it unwise to count on millisecond-scale timing accuracy. Maybe these issues have been solved in the past. I don’t think there is necessarily a very good solution, though. It’s a small problem if a message character gets corrupted. The message probably won’t make sense; that can be handled with an error message and some recovery process. But what if the linend itself gets corrupted? Then your program won’t see it as the conclusion of a message, so it will continue capturing characters into the buffer. Then what? Two messages are now corrupted. Still no big deal. But then you have an increased risk of buffer overflow. ( You are checking to avoid buffer overflow, right? ) How to handle that? Flush the buffer and hope the next message is better? But the next message will most likely be broken, ’cause you probably flushed the buffer halfway through it, discarding the first part. Finally, what do you do if the source goes away? There might be a partial message in the buffer. Should you have a timeout, after which you conclude that the source has crashed, and you need to flush the buffer so the next message that arrives, when the source has recovered, will not also be clobbered? Think of these possibilities. Writing embedded software is not necessarily as simple as we’d like. But if we consider all the possible ways something can go wrong, and deal with them carefully, we can make software work well and robustly. I have a demo/development setup on a small breadboard which powers an ESP-01 ( the small, cheap, 8-pin breakout board for an ESP8266 chip ). In addition to being a programming board, it has 3v3 voltage regulation, a pot, a temperature sensor, a simple LED, and a WS2812 3-color LED. I have the installed ESP8266 running a program to subscribe to an MQTT broker and light the LEDs according to publications on a certain topic. I’ve developed another small program which listens to a 115200 baud serial connection and accepts JSON messages which instruct it to connect to a WiFi, to publish values to an MQTT topic, or to subscribe to an MQTT topic. It is intended as a general-purpose glue service for an otherwise dumb microcontroller to communicate with remote telemetry. I have also a Teensy 3.1, which supports capacitive touch sensing, interprets the values as control signals, and via the text-to-MQTT glue service publishes them, whence they will control the aformentioned LEDs. The program that does this is also on Github. It all works, sort of. I’m considering it to be at the late-alpha stage of development. I believe that the UMass IT policy forbids “rogue” WiFi gateways in order to prevent anonymous Internet access, so that nefarious actors can be identified. I needed to create an IoT server for my lab, M5, and it needed to be accessible via WiFi. It also needed to have Internet access so that I could keep its Linux firmware up to date. I will address the first and the last of these actions. Whew. I just read LadyAda’s post about using Doxygen to document a project, and setting GitHub up to not only host the files, but also to serve the documentation as html. I managed to do most of it! I created a separate GitHub project according to her instructions, restructured my code as a library with an example (main) program, and pushed the code up to GitHub. I read (some of) the Doxygen manual, and added a bunch of structured comments to my library code. I installed and ran Doxygen, fixed the documentation, many times, and got it all working. But I could simply upload the documents directly into the gh-docs branch of my project and ask GitHub to serve them. So I did. I like this. I think this will be how I document future open-source projects. I’ve just (belatedly) added Doxygen commentary to the firmware I’ve written for the OpenEffects Project hardware. It was half a day’s work, but it was reasonably painless to install Doxygen and Graphviz dot, even starting from scratch as I was. I had blanched at the idea of manually diagramming the class hierarchy and arranging the comments so they made sense. Doxygen handles it well enough that I didn’t have to struggle (much). Creating complex firmware for existing hardware is often complicated by unforseen ( or ignored by the hardware designer ) human-interface issues. One example of this situation comes up when a project requires more settings than there are physical controls for. Modern cameras provide examples of the problem, and also of its solution. Consider the case of a camera with a touchscreen. Problem solved! The touchscreen provides the capability of having a given location on the screen provide control for many different things, each made available with a different screen display. Some modern cameras, however, have a few buttons which could be called multipurpose. In one mode, a given button might be mapped to a different function than it is in another mode. I’m currently working with the OpenEffects Project hardware, which sports 4 potentiometers. I want to experiment with quite a few different effects and explore their interactions with my electric violin. The number of parameters for these functions in total is about 40. I broke up the settings so that each effects module had its own settings mode. Its settings are displayed and can be changed while its mode is active. Since this design overloads the potentiometers, I had to think long and hard about what should happen when the mode is changed, since the pot can’t move to reflect the ( different ) setting of the ( different ) parameter of the mode’s ( different ) effect module. The need to ignore a pot when the mode changes brings up a *different* gotcha. Reading a voltage several times will often yield different values. This will cause the pot value to be perceived as changed. Rats. So I had to add a guard band around the current setting, considering any reading within the guard band to be unchanged. I also added an EWMA smoothing algorithm to minimize the required size of the guard band. The larger the guard band, the more one has to move the pot in order for the change to be noticed. The longer the averaging period, the more sluggishly the reaction to a change occurs and settles. I ended up by splitting the difference to balance rotational- and time- sluggishness. But it works! In my plan to have an object for the open effects box as a whole, including the firmware and the overall structure of the user interface, and another to wrap the physical object including the pin assignments, switch handling, etc., I wanted to have the hardware wrapper able to call back to the overall object when a switch changes state or is held to auto-repeat. The callback cannot be a static function, as it needs to modify member variables. While it is apparently possible for an object to set a callback to one of its own methods, that callback has to include some way to refer to the object itself, so that the object structure and variables are available. However, that requires the hardware wrapper’s setCallback method to know about the calling class. Thus the hardware wrapper class has to include the calling class’ header file; but the calling class has to include the hardware wrapper class’ header file, since it’s instantiating that class for part of its functionality. Seems like an infinite loop of inclusion; this can be protected in the usual way, but I haven’t been able to make it work. Thus I’m going to abandon this line of attack and send a bunch of pointers to the hardware wrapper so it can set flags “thisThingyHasChangedState” for the calling class to poll. Ugh.